OPBF Female Minimumweight title up for grabs! The Minimumweight division in female boxing seems to be widely dominated by Asian fighters. We recently saw Mako Yamada announce herself on the world stage by winning the WBO female world title, we also saw Mari Ando win the WBC title late last year and in the past fighters like Naoko Fujioka and Etsuka Tada have dominated the division. With that in mind the division is an important one to Asian fighters, especially those form Japan who appear to have a genuine desire to become the best female fighters at 105lbs. 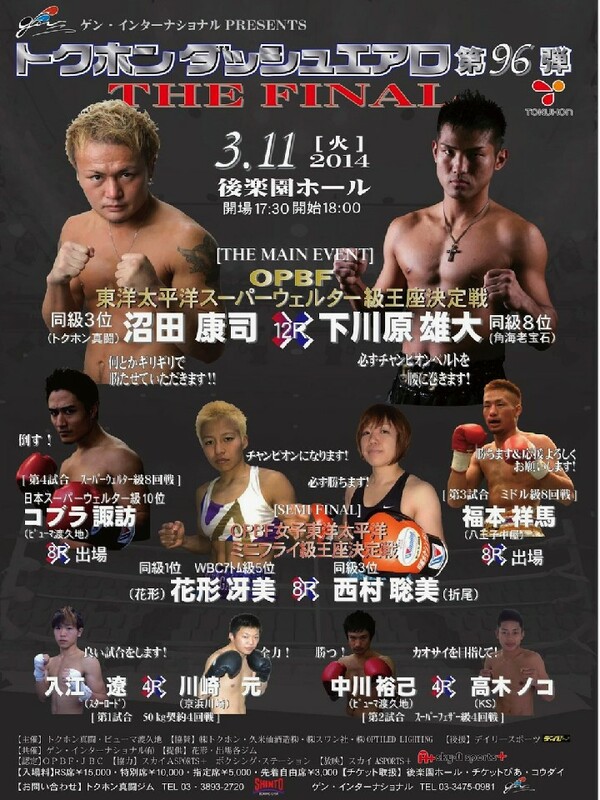 With that in mind we feel that there is more to the upcoming contest between Saemi Hanagata (8-4-2, 3) and Satomi Nishimura (6-0, 1) than just the OPBF Minimumweight title that both women will be trying to claim. We feel that this bout is more about the winner planting themselves as a top contender in the division and making a claim for being a future world title contender. Of the two fighters it's Hanagata who probably has more to lose. She has the more damaged record already and will know that one more set back could well send her well back down the rankings and she would likely lose her #5 WBC ranking with a loss, whilst a win would certainly boost her place from #13 with the WBA. The reason Hanagata has got a somewhat muddied record is down to the fact she has faced several good fighters. These have included former world title challengers such as Jujeath Nagaowa, Masae Akitaya and Yuko Kuroki as well as current world champion Momo Koseki. Those fighters, between them, would mess up anyone's record in the lowest weight divisions. Whilst Hanagata has lost to the likes of Koseki and drawn with Kuroki and Akitaya she has also experienced what it's like to fight some top fighters. Those fights will have done more good in terms of her development and helping her improve than 14 fights against complete novices who lined up to lose. They will also have instilled a real grit and confidence in her that she will, one day, become a champion herself despite failing in previous title fights. With an unbeaten record Nishimura looks better on paper than Hanagata though unfortunately when you look beneath the surface of Nishimura's record you see how deceiving it is. Her 6 bouts so far haven't come against anyone of note and in fact 4 of her 6 opponents have been debutants. Between all 6 their combined record has been 11-10-1 with Thai journey woman Nongbua Lookprai-aree accounting for 8 of the wins and 9 of the losses. Unfortunately for Nishimura she hasn't been given any sort of experience building fights. Instead she's been given record padding fights. That's all well and good when you're young but at 33 years old that lack of development tends to come back and bite you. With the difference in experience levels it's hard to pick against Hanagata who may have won just 1 of her last 5 but she has been very competitive in those she didn't win, including the Koseki fight, one of Koseki's toughest. Nishimura will likely start well but Hanagata's experience will see her figure out Nishimura early on and beat her down the stretch with Nishimura wondering why Hanagata is hitting her back unlike her previous 6 opponents. The winner will likely only be a win or two away from a world title fight so we'd keep a serious eye on the result of this one.